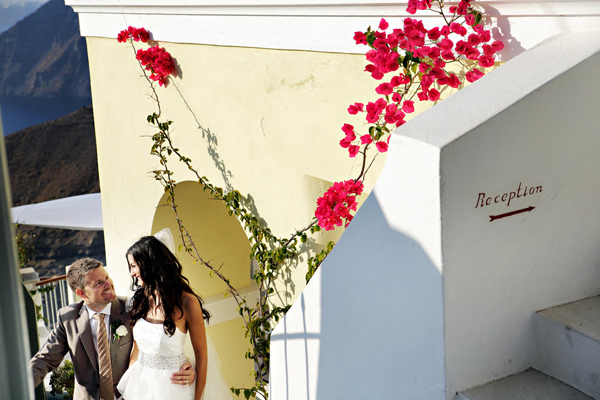 «We fell in love with this Greek island from the first time we visited the island…we always said that it would be the best place to have our wedding»,the charming and beautiful bride mentions and from the wedding photo shoot that follows, you will believe that she lived her dream, a beautiful Santorini wedding. 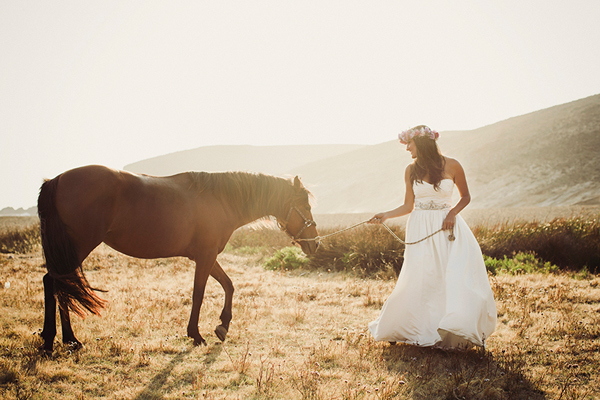 The silk duchesse and organdy wedding dress from Paloma Bianca was stunning. It had a strapless draped bodice with a crystal waist belt and an organdy ruffled skirt. 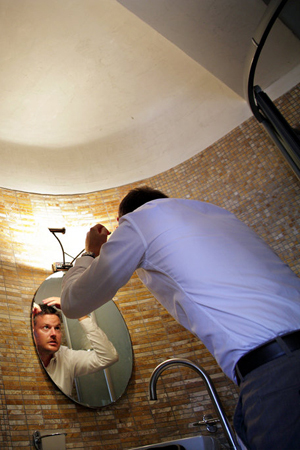 The sweep train added perfection to the entire look. 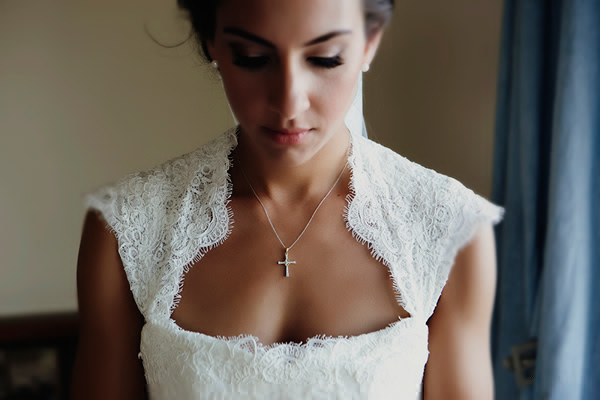 The bride’s makeup was minimal and it enhanced her natural glow. The make up artist Bianca Treveza, emphasized Christina’s beautiful eyes and gave her an extremely soft smoky eye look. 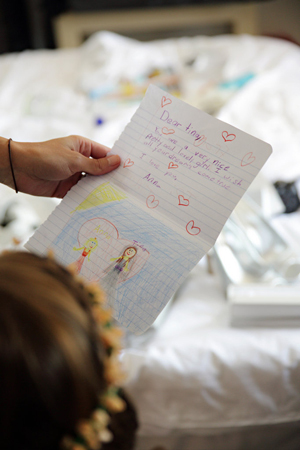 A sweet and touching letter from the bride’s flower girls. 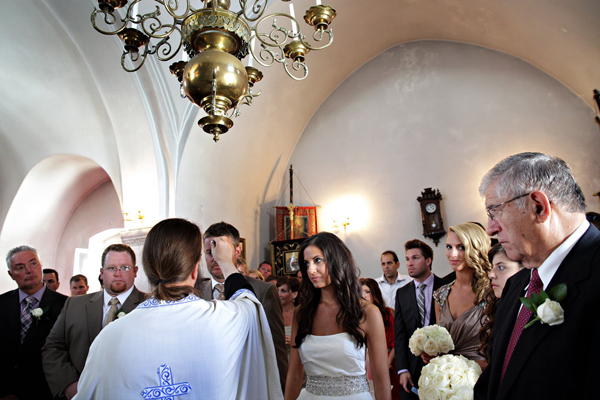 The maid of honor’s taupe colored dress was extremely stylish. 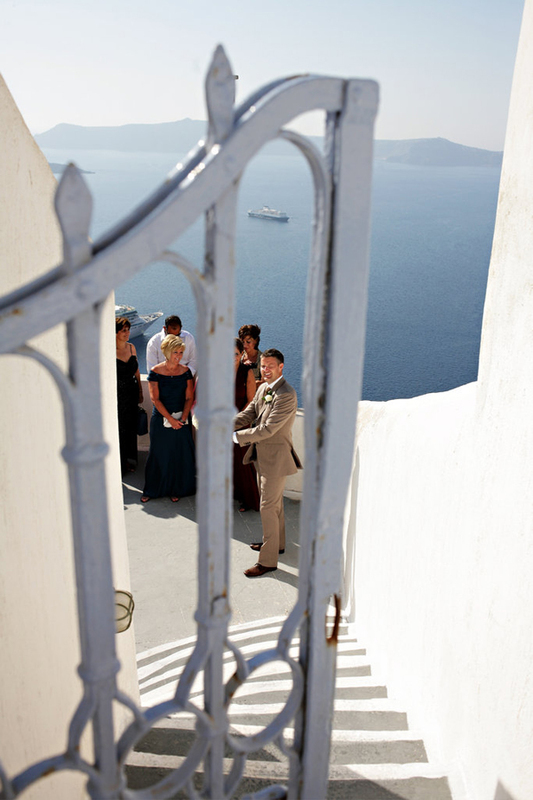 The groom wore a taupe colored suit, Excellent choice for a fall Santorini wedding. 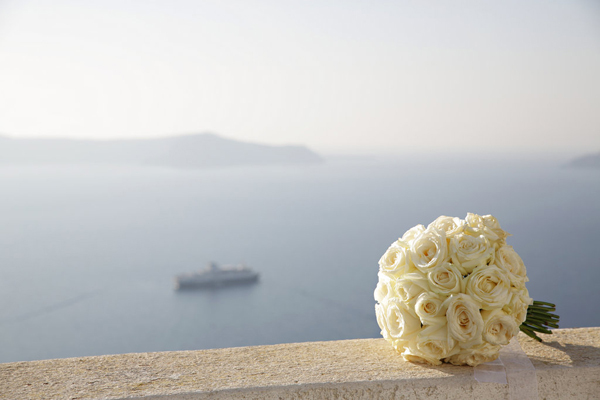 The bride wanted her bridal bouquet to have only simple but elegant white roses. 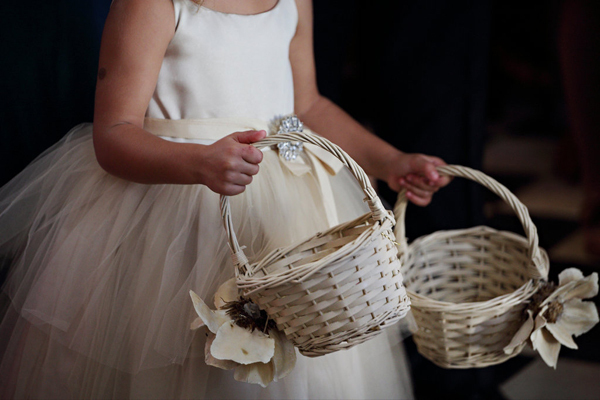 The flower girls’ dresses was taupe colored to match the groom’s suit. 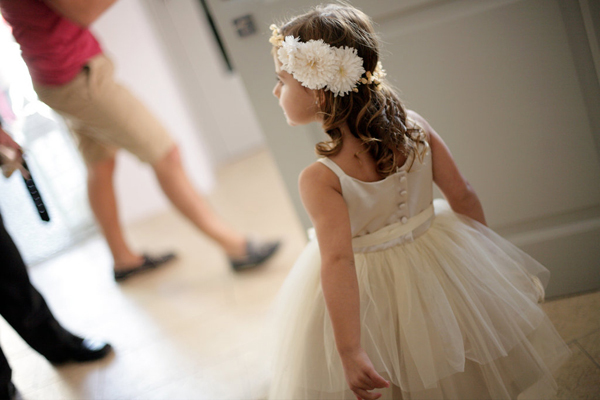 Lovable and angelic flower girls. 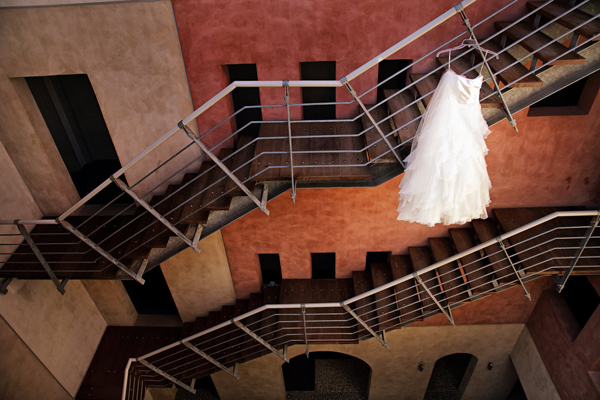 One of the most beautifu moments for the bride was: “When I was just about ready and I was standing on my balcony of my hotel room. 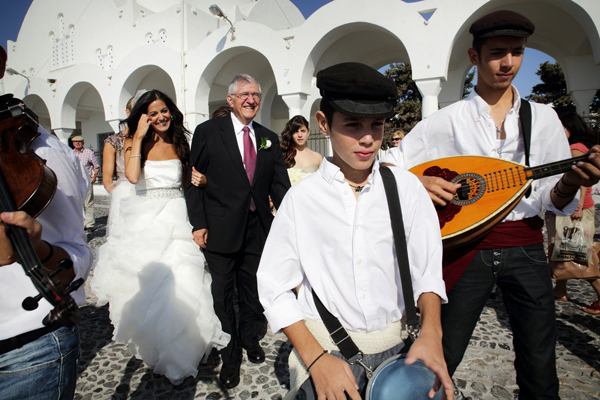 From there, you can see Agios Minas, the church where I was getting married. 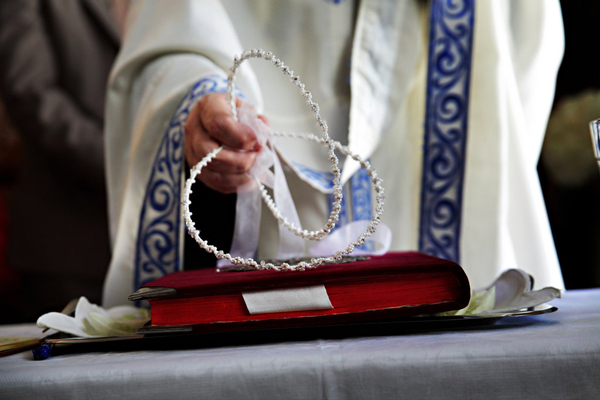 I could see all my guests and husband-to-be standing outside of the church, waiting for me. 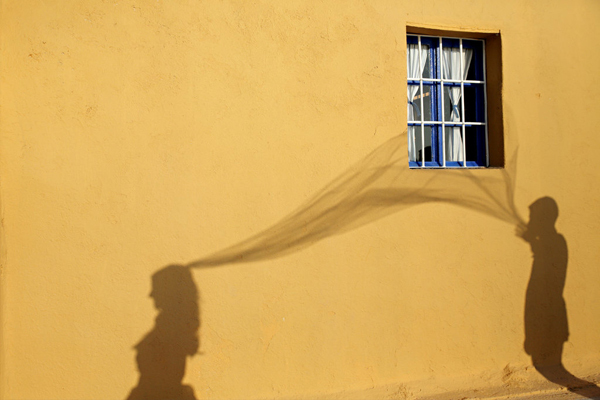 That was when it became very real that I was going to get married”. 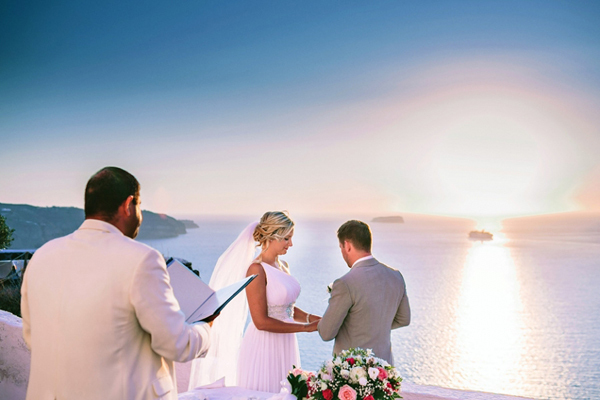 “My absolute favorite moment from our Santorini wedding was walking down the stairs to the church and seeing Jonathon waiting for me at the bottom of the stairs, ready to take the next step in our lives together”. Jonathon proposed while they had gone on vacation to a little island off of Puerto Rico called Culebra. 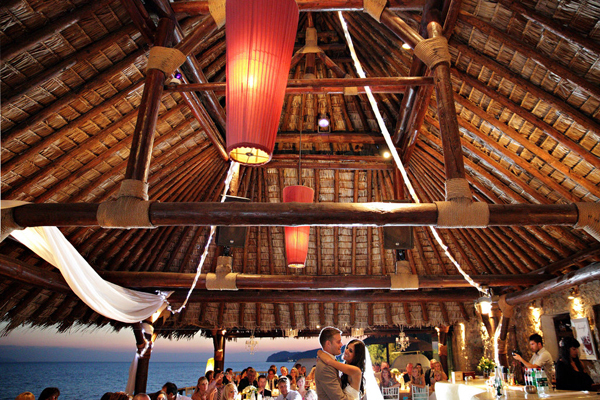 The bride mentions that: “It is one of our favorite places to go to, as it is so beautiful and peaceful. We were walking on the beach and he got down on one knee and proposed. I thought it was a joke, and just laughed. He had to ask me two more times before I realized he was serious! And then, of course, I said yes”. 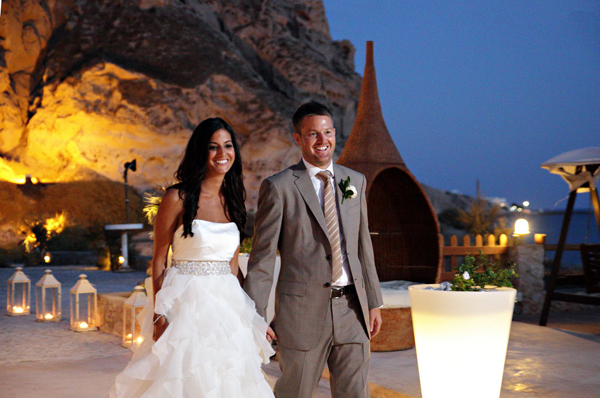 The Santorini wedding reception took place at the Theros Wave Bar. 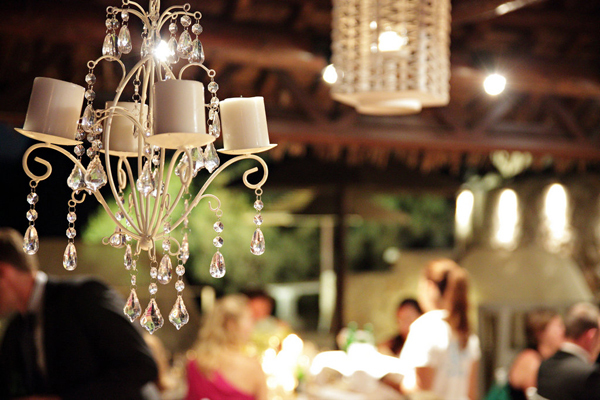 A wedding venue that is known for its private setting, its sense of style and of course for their amazing cuisine. 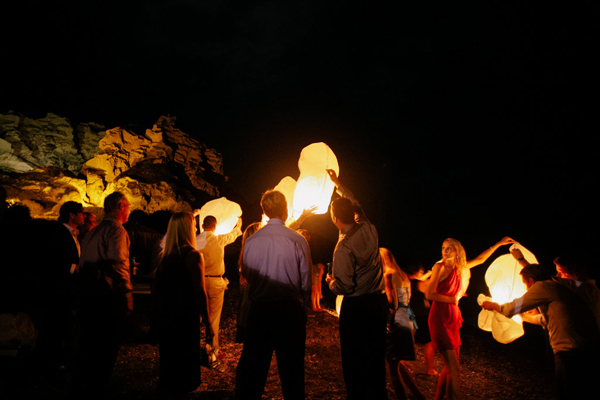 Poema Wedding planners undeniable did a commendable job. 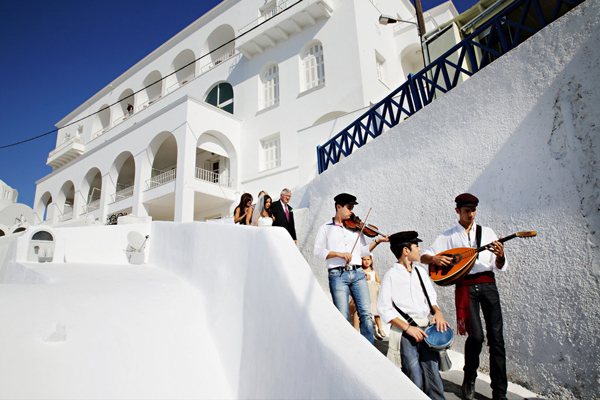 The Santorini wedding theme was rustic glam. 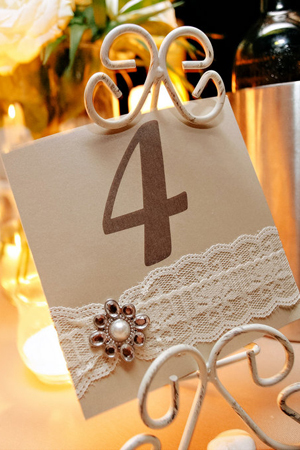 In the wedding décor there was a harmonious combination of rustic touches (burlap) and glamour influence (rhinestones and lace). The unforgettable night ended in a beautiful way. 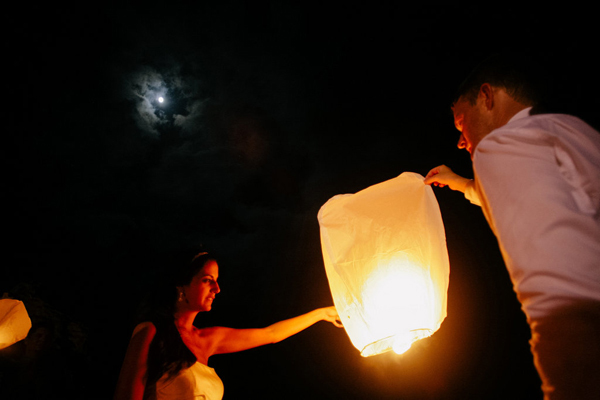 Christina and Jon chose a unique wedding idea, to offer their guests wedding lanterns. 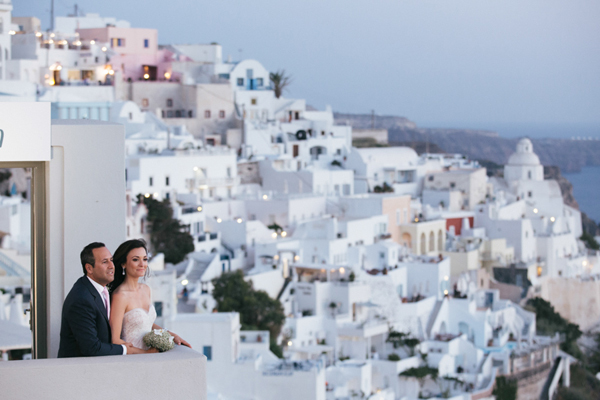 Don’t miss this incredibly romantic wedding video by Wedfilms Cinematography… you will really feel that are celebrating with couple during their Santorini wedding ! 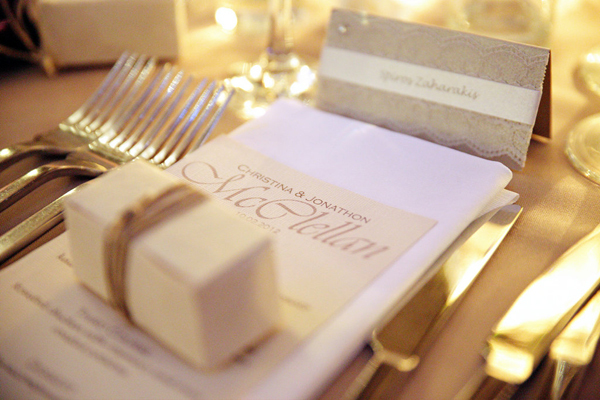 Spicy Bites Catering, Wedfilms Cinematography are on Chic & Stylish Selected Vendors.